"Once I went professionally to an archaeological expedition--and I learnt something there. In the course of an excavation, when something comes up out of the ground, everything is cleared away very carefully all around it. You take away the loose earth, and you scrape here and there with a knife until finally your object is there, all alone, ready to be drawn and photographed with no extraneous matter confusing it. That is what I have been seeking to do--clear away the extraneous matter so that we can see the truth--the naked shining truth." The primary focus of this blog is to judge mysteries of a particular vintage, uncovered from the dust-covered shelves of the endangered, second-hand bookstores or plucked from the catalogue of an online book dealer, occasionally venturing out of the obscure to discuss one of the modern guises of the traditional detective story, but, notably, I have mostly left the familiar brand names alone. This has a practical reason: I already covered most of them before I began blogging, from G.K. Chesterton, Conan Doyle and Ellery Queen to Agatha Christie, Dorothy L. Sayers and Edmund Crispin, forcing this Sommelier of Crime to descend into the dark and mouldy cellar of the genre to hunt among the cobwebs and dust bunnies for more, but after patching up my list of favorites I wanted to revisit some of these old favorite – already resulting in a review of a novel that I'm particular fond of. It also dawned on me that it had been ages since I read Agatha Christie's Death on the Nile (1937), or any story from her hand for that matter, which is an oversight that needed to be corrected ASAP. 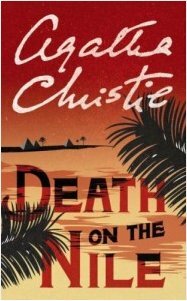 Death on the Nile has a plot as classic and well-known as two other of Christie's most famous novels, The Murder on the Orient (1934) and And Then There Were None (1939), and writing a synopsis is almost superfluous, but hey, it would be a very short review otherwise – so here we go anyway. Death on the Nile is, for me, the quintessential Agatha Christie novel and her most successful treatment of The Internal Triangle, which in turn produced a set of her best and most convincingly drawn characters. The rich and glamorous Linnet Ridgeway, the girl who had everything and wanted Simon Doyle, the man of her friend, Jacqueline de Bellefort, as well and snatches him away from her like Arsène Lupin relieves a cantankerous Duchess of her pearl necklace. Betrayed and broken-hearted, the hot-blooded Jacqueline begins to stalk the newly wed couple during their honeymoon in a particular nasty, but effective, way, eventually cumulating in a shooting incident in the saloon of the S.S. Karnak – gliding over the waters of the ancient Nile. During a heated and emotional scene, Jacqueline whipped out a small pistol and bored a bullet through Simon’s leg bone, practically leaving him an invalid, after which she immediately wanted to kill herself and needed to be sedated with a nurse standing guard over here the entire night. However, when everything began to quiet down, someone seized the moment and purloined to gun, sneaked into Linnet's cabin and squeezed the trigger with the muzzle pressed almost against her head. With Simon and Jacqueline scratched off as suspects, Poirot and Colonel Race have to look among the cast of gargoyles that make up the remainder of the passengers for an assassin and they are remembered of a remark from Linnet how she was surrounded by enemies. As Milward Kennedy remarked, "a peach of a case for Poirot." Having not touched any of Christie's books for several years, it had slipped my mind how good she actually was and how the title of the Queen of Crime is no exaggeration in any way – even after all these decades and with the 100th anniversary of the publication of The Mysterious Affair at Styles (1920) looming at the horizon. It also surprised me how still remembering the solution enhanced my enjoyment of the book instead of deterring it. I simply marveled at recognizing all the carefully planted clues, both physical and psychological ones, and it's almost inconceivable that anyone could miss them when you know how obvious they actually are, but that's the craft of the mystery novelist for you – and Christie was at the very top of the game. I always thought of Death on the Nile as one of the grand whodunits, but I think I appreciate it now more than I did back then when I read it for the very first time. There's also something else I appreciated, but I can't tell without running the risk of giving too much away to the clever and observant reader. All in all, Death on the Nile comes fairly close to being a perfect detective story, with a plot and characters that balance each other out to a tee, and may very well be one of the Seven Wonders of the Golden Age. Yes, I will (probably) dust-off one of the Christie's forgotten, attention-starved contemporaries for my next post. Maybe. I reread this too a few years ago and quite enjoyed it, despite having seen the film when it first played, back in 1978 I think. I agree with your assessment of the plotting. Another thing about it is that some of the characterization is really quite good. I reread this and Murder on the Orient Express at the same time and found myself enjoying Nile much more. Once you know the great twist in Express it's not all that interesting, in my view. Given the potential emotional content of the novel (kidnapping, etc.) it's oddly unengaging. I enjoy the 1974 film much more (despite Albert Finney's Oscar-nominated performance, which I now find grating after so many years spent with David Suchet--Finney sounds more like James Mason than Poirot). I will always have a soft spot for Orient Express as the first GAD novel that gave me that pleasant jolt of surprise when I learned its solution, but yes, once you're in the know the trip isn't nearly as interesting as it was the first time around. But that first trip is enough to justify its reputation. And I'm convinced that, one day, we can watch a digitally altered version of the 1974 film in which they replaced Finney with Suchet. Mark my words! One of my all-time favorite mysteries. I have photos of me somewhere riding a camel by the Pyramids and standing in front of the hotel where Poirot stayed in Egypt. This too is one of my favorites, though my memory of it is that outside of Poirot and Colonel Race, there's really no one to like in this this story, Probably why it's not at the top echelon of my own list of favorite Christies. But I enjoyed reading your post nonetheless. It is possible to forget a Christie. Even as many times as I've read and re-read her books, there are always one or two that slip under the radar. You can definitely count me as a big fan of this novel too - and you raise an interesting point about re-reading Christie even when you know the ending. Like Curt, I saw the Ustinov version on its cinema release in 1978 and was enormously impressed by the cleverness of the plot. Nowadays I;m not sure I would still want to read the book, but at the time (long before we got a VCR) it was a way of recapturing the movie, but instead it turned me into a budding GAD fanatic. I do like this one a lot, the pleasure of it only slight reduced when la Christie so mercilessly re-utilised the plot for EVIL UNDER THE SUN. Evil Under the Sun also recycled the short story "Triangle at Rhodes," which makes it perhaps her least original and creative of all her most well-known and popular novels. Still a good read, but not one of her best – especially if you read back-to-back with Death on the Nile. A newbe would think that Christie wrote the same book over and over again. You're the living proof that if a movie adaptation stays faithful to its source material (in spite of it's changes and miscasting Ustinov as Poirot, at it's core, it was still Christie's story in all its brilliance) you satisfy old fans and draw-in new ones. It's been long ago when I've began to read your blog and ever since I follow it, your reviews just keep on impressing me to the highest degree. It's a pleasure to read it and I'm very happy that you chose an Agatha Christie novel this time cause in Hungary she is the number one mystery novelist (although those Scandinavian „serious crime writers” get to be more and more popular here too) and she was the one who endeared me to the genre so she'll be always my favourite of the Golden Age Masters and Mistresses. In my view, there are some so called „masterpieces” in Christie's output that are a little bit overhyped. For example, I know thar you, John Curran, Robert Barnard, Symons and lots of English reviewers regard THE ABC MURDERS as one of her very best but I myself find it one of the greatest letdowns of her career. The idea is superb but the solution (for me, at least) was strikingly obvious. And Hastings was a bit annoying in that novel, not that much as in THE MURDER ON THE LINK but definetly was. Fortunately, DEATH ON THE NILE is the member of another bunch that I call „worthy for the hype" cathegory. I've read it some six or seven years ago as a small boy and when Poirot exposed the culprit I just couldn't believe my eyes... then he explained it with all that clever little clues... and I was shocked. It was AMAZING. Not just the plot and the dénoument but the characters (I remember liking Cornelia Robson very much), the setting, the atmosphere were all top-notch. I hope I can read it again in the future to see if it withstand the test of time but I think that the enjoyment will be the same. It's a true classic, one of the brightest gems on Christie's golden crown. I'm looking forward to your next review! Glad to have you among my regular visitors and thanks for the kind words! Unfortunately, she seems to be the only Golden Age writer besides Simenon who could succeed widely among the Hungarian public. It's a shame because in the previous regime there were two big crime book series wherein a lot of classic mystery novels were published in Hungarian translation. For example Carr's THE CASE OF THE CONSTANT SUICIDES (one of my favourites) or Ellery Queen's HALFWAY HOUSE. And of course a lot of Christie, Simenon, Ed McBain. There was also a magazine which published serialized novels, many written by classic authors. There are a lot of old translations, made before the war too. But nowadays Christie is the only one who seems to have survived the depression. The new, post-communist McBain and Simenon series are on hiatus and the Dickson Carr series stopped after the first two releases some years ago. Luckily, we still have the yearly seven-eight Christie with great translations and beautiful hardcovers (!) and some very nice Ross MacDonald novels by the same publisher but this is all. So I hope that next year my family gives me a Kindle for my school leaving because those Gladys Mitchell and Christianna Brand e-books seem to be delicious. Just as the Carr and Queen ones. Well, I hope you get that kindle in order to get your regular, but varied, fix of mysteries. Gladys Mitchell and Christianna Brand were, IMHO, more deserving of the title Crime Queen's than Margery Allingham and Ngaio Marsh, but be warned, Mitchell is somewhat of an acquired taste.